The Yamaha PSR-EW300 packs in all of the impressive power of the PSR-EW300 but adds a longer 76-note keyboard to widen the playable range and ups the polyphony to 48 notes. This allows you to be more expressive than ever before and is a natural step up from standard 61-note keyboards. The PSR-EW300 has a built in 76-note touch sensitive keyboard that allows you to play expressively. This is ideal when performing pieces with any of the 500+ high quality voices that cover everything from grand piano, organ, ensemble, synth and much more. Yamaha have even incorporated some of their trademark Sweet! and Cool! sounds into the PSR-EW300 but are often found on much higher spec models. 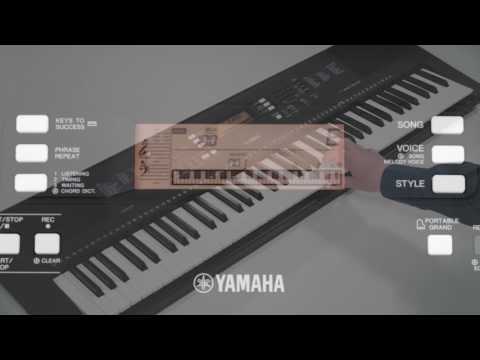 The PSR-EW300 Portable Keyboard comes with Yamaha's own "Keys to Success" lesson functionality built in. These lessons are designed to train your timing, dynamics, note familiarity and more so that with time your playing can be dramatically improved. There's also online access to Yamaha's songbook so that you have the sheet music for the built in songs. The keyboard can also be split into "duo" mode so that a student and teacher can sit side-by-side for lessons and use the same playing range. The PSR-EW300 has an Aux input which means you can connect your smart device, MP3 player and more to play the music through the PSR-EW300's internal speakers. This is great for when you want to jam along with your favourite songs. There is even a melody suppressor built in so the volume of the main melody will be lowered for you to play over the top. USB connectivity means you can also hook the PSR-EW300 up to your Mac or PC for using it with your favourite music production software to create complex music. Other connections include a sustain pedal and a headphone output for when silent practice is required. The 76-note PSR-EW300 is an exceptional keyboard that can help you deliver great performances and improve your abilities, discover the power of PSR today.